It makes a strange kind of sense: when travelling with your mini-me, where better to go than a miniature country? And happily Liechtenstein, the tiny principality nestled between Austria and Switzerland, has much more to offer than its novelty size. It is scenic, safe and the perfect destination to travel with children. With Alpine trails, year-round sports and some of the cheeriest adventure parks around, Liechtenstein packs a wealth of attractions into its tiny borders, all while retaining its breezy, spacious charm. You can already hear the outcry as your plan for "another boring walk” is met with rebellion. Fortunately a good number of Liechtenstein’s stunning mountain trails are easy for parents with prams and many are themed to keep children interested. For wannabe knights and princesses, try the Walser Legends Trail, with signposted stories and entertaining mythical carvings. Or if there is a budding astronaut in your brood, the Planet Trail maps out the solar system with silver orbs and signposts, so you can watch as your children race towards Jupiter. And there are plenty of picnic and barbecue spots along the way. With its high-adrenaline name, the diminutive, Wild West-themed playland Neuguthof Adventure World may be overselling itself a little. There is no Disney razzle-dazzle or rollercoasters, but the park’s tiniest residents have an entire miniature town, Rabbit City, to lollop around, including a rabbit saloon and rabbit jail. Should your children manage to tear their eyes away, they will also be able to stare down the park’s absurdly cute pygmy goats, enjoy a mini safari and run you ragged in the fiendishly difficult corn maze. In winter, take to the slopes in the town of Malbun, a tiny ski resort boasting shorter queues than other Alpine destinations. There are frequently some good offers for kids to ski free. Malbi-Park, a pint-sized (and fully supervised) snow park, lets littler skiers try out the snow without being unleashed onto grown-up slopes. In the summer months, even the mini-golf courses have a stunning Swiss Alps backdrop. Throw in pristine swimming pools, falconry shows and lungfuls of fresh mountain air, and the kids should be out like a light come bedtime. The adorable miniature CityTrain weaves through the quaintest streets of Vaduz, the capital, on a leisurely 35-minute journey, pausing by vineyards and passing show-stopping views of Liechtenstein’s crowning glory, Vaduz Castle (with a few jolly tales of Liechtenstein's well-loved prince along the way). Warning: this pleasant distraction is almost guaranteed to have your brood singing the maddeningly catchy Liechtenstein CityTrain theme song well into the afternoon. 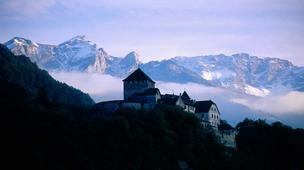 The family-friendly hotels in Liechtenstein have bonus treats for tired parents. Hotel Turna has a daycare centre and a children’s playroom, and the Gorfion offers children’s swimming classes, a supervised children’s restaurant (allowing you the occasional romantic dinner for two), and a "sleep in service” where the hotel will entertain your kids from 7am to 11am. It’s easy to enter Liechtenstein by car or bus from Switzerland and Germany (the closest airports being Zürich and Friedrichshafen). Another easy alternative is taking the number 12 bus from Sargans station in Switzerland, a few minutes’ train ride from Zürich. It’s a smooth journey, with connecting buses every 15 minutes, and the mountain views should keep you and your flock well entertained. The capital, Vaduz, is as easily navigable on foot as you’d expect from this petite country, and most city attractions are within walking distance. Easy bus rides connect Vaduz to Malbun and the rest of the country.